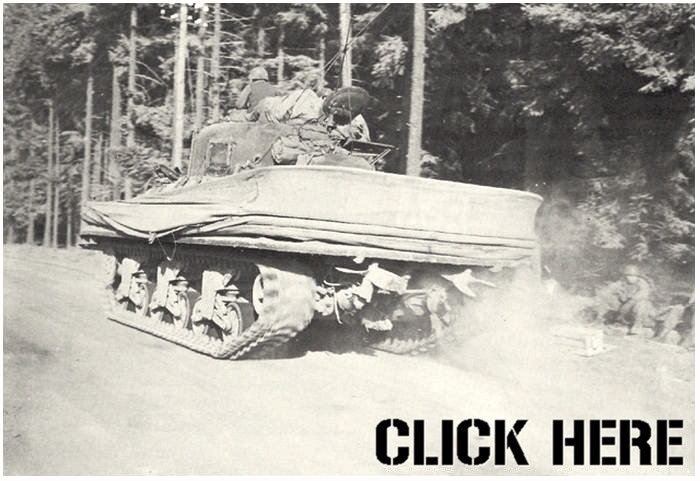 Below a picture is shown with an M4A4 Sherman tank in a	'Duplex-Drive' (DD) disguise. Surrounded by a canvas skirt, the tanks ‘hung’ as it where in this skirt. 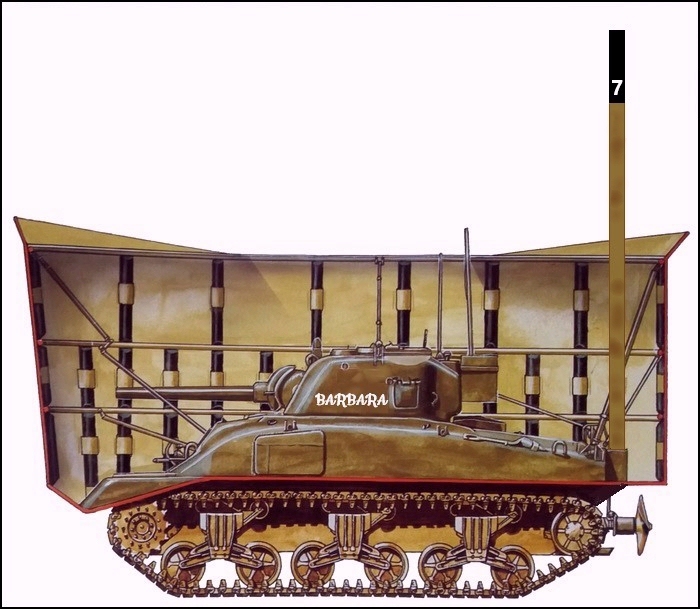 These tanks would be launched far out in the sea, and were driven forward by two propellers at the rear. With only a small portion of the canvas skirt above the waves, the tanks would suddenly pop out of the water, onto the beach and surprise the enemy. The British and the Canadian troops used only the M4A2 and the M4A4 for the DD version. The Americans used for the DD version the M4 and the M4A1, and only the latter version for the landings on the Normandy beaches on June 6, 1944. And with the last one, the M4A1 version, was something strange which would keep me busy for years,…. The 'Duplex-Drive' (DD) tanks would be launched from LCT’s at 6000 yards (5500 meter), when the sea was not TO rough. Every LCT had four DD tanks on board. But despite that the sea was very rough, some LCT launched the DD’s early. After the war some DD’s were located at 9000 yards from the coast. Of the 32 launched DD tanks from the 741st Tank Battalion, only two would reach the beach, in the left sector, by ‘swimming’. Three other DD tanks were brought in by LCT-600. After the first DD drove from the ramp of LCT-600, and sunk before the eyes of the crew of the LCT, on board of the LCT-600 the order was given to bring the tanks closer to shore. The second tank, ready to launch, drove a bit back and damaged the canvas skirt, or the part of the ramp (sources differ). Now the order changed again, to bring the tanks on to the beach. 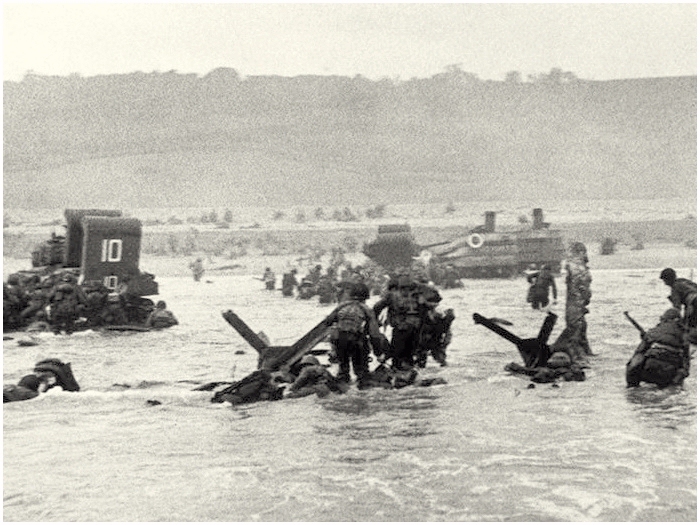 The DD tanks of the 743rd Battalion on the right flank of Omaha Beach were brought by the LCT’s all the way to the beach, although some were launched close to it (some of the last became trapped in the obstacles under the waterline). When these tanks rolled onto the beach near Vierville-sur-Mer, they became sitting ducks for the German guns. 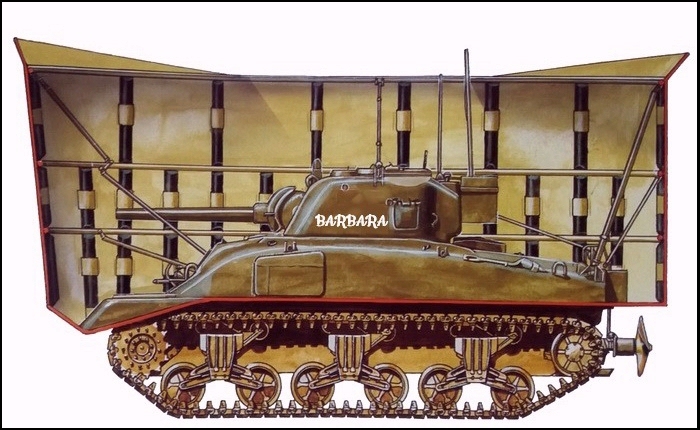 In the book 'Barbara' by Wayne Robinson we follow a Sherman tank, in 'Duplex-Drive' (DD) disguise, and her crew. The story around the M4 Barbara is fiction, but the events did happen for real. She landed during the first wave on Omaha Beach. 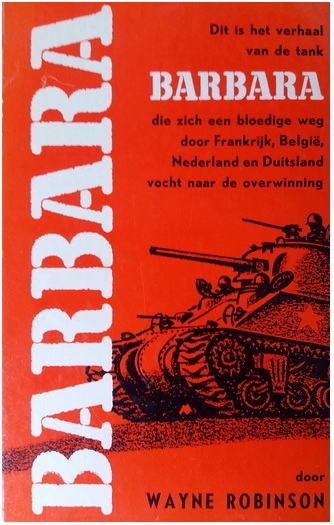 I have in my possession only the Dutch translation (from 1965) and this has some flaws in it. One of these ‘flaws’ (as I thought) handles on the ‘ventilation shaft’ on the heck of the tank. I translate the next sentence from the Dutch text back to English. 'In her battalion she was tank no.7, second platoon, B squadron. That number was high on top of her new ventilation shaft , atop of her screws. The white stood clear and bright against the dull army green paint she was covert with’. I always thought that Robinson used his imagination and was mistaken the DD version on this ‘shaft-business’ with the version of M4’s with the wading trunks. These Shermans could maneuver through shallow water and took air, and blew of exhaust through two huge chimneys (or funnels). But, that someone who served with the 743th Battalion (the first who dropped there DD-tanks for Omaha in the right sector) was able to make such a mistake? On the coming pages, the research will focus on the sectors EASY-Red and FOX-Green of Omaha Beach. There are more pictures from DD tanks in these sectors, than in the other sectors of Omaha Beach. And that is peculiar, because much more DD tanks successfully landed in other sectors than on EASY or FOX, such as on DOG, and survived. 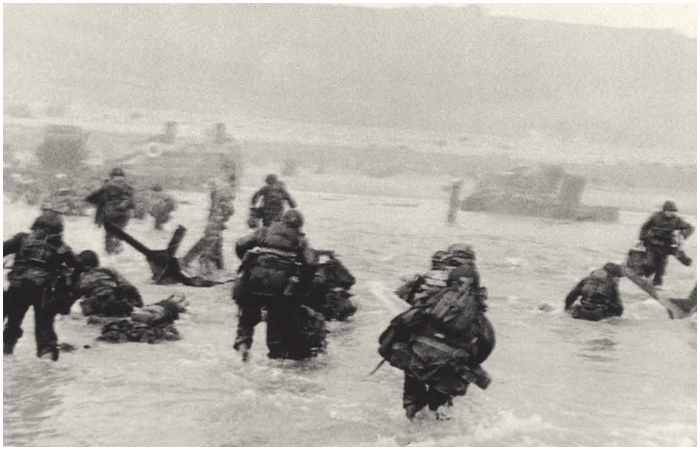 Enter Robert Capa, the photographer that went with one of the first waves that landed on Omaha Beach. According to Capa, these men belong to Easy-Company, 16th Infantry Regiment, of the 1st Infantry Division, the company where Capa traveled with to the beach. It is commonly known that the work he shot that day was ruined for a great deal in a laboratory in England. Only a few survived, and despite there damaged look, or because of that, they became world famous and are regarded as thé pictures that captured the onslaught of Omaha Beach at there best. Finally I was able to find one of these pictures in a rather good state, and what attract my attention,…? The picture above shows some interesting features. This picture is taken during one of the first waves. 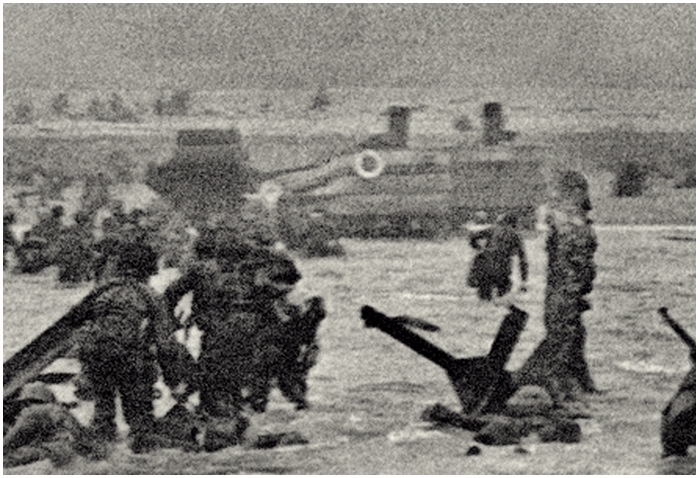 Five minutes before H-Hour, and the first wave, the DD-tanks came ashore. At H-Hour, around 06.30, the LCT's went in with the Shermans that could wade to shore (a minute before the infantry would land). 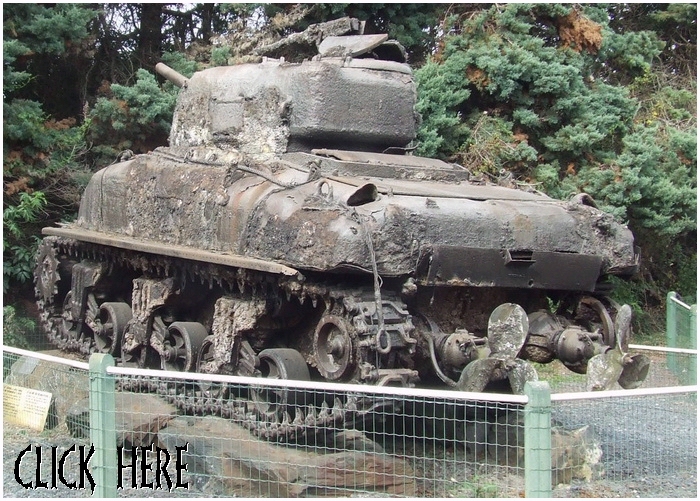 Already can be seen, on the left, a Sherman with wading trunks, with a large number ‘10’ on the back chimney. Somewhat to the right of the middle is another wading (or put out of action) ashore. But, if we enlarge the picture, two other vehicles can be noticed. These are two DD-tanks with the canvas skirt still up at the back, but lowered on the front. Even the two little screws are visible at the lower back of the left DD. The picture is taken between EASY-Red and FOX-Green, almost in front of Widerstadnest Wn 62. 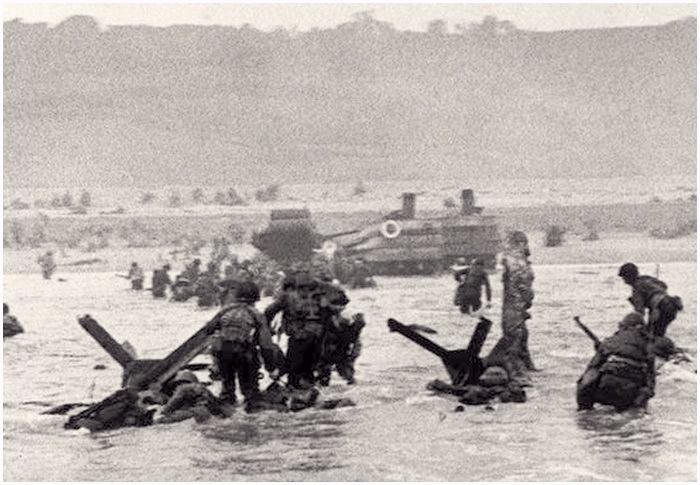 The men in the water are from the 16th Infantry Regiment, 1st Infantry Division, probably from Easy-Compagnie, the unit Capa was with. If we blow up the picture even more, the dark colored rectangle shape can be seen that is protruding out of the canvas skirt on both of the DD-tanks. Are these the chimneys Robinson is mentioning? These were the only pictures, as far as I knew, of DD-tanks (probably from the 741st Battalion) where chimneys could be seen. Was this an adaptation only for some type of Sherman tanks, like the M4A1 version, that had Omaha Beach as there destination? 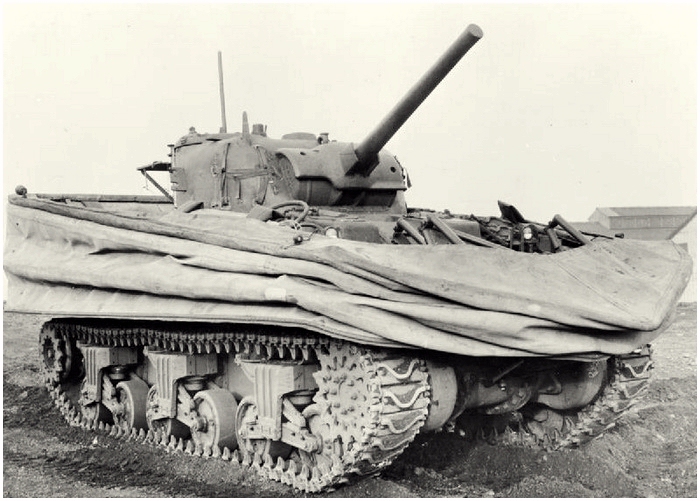 I have recently viewed the thread from 2008 on the ww2 forum whilst looking for reference pictures of deep wading gear and the question you posed there and on your site about the chimneys on the Omaha DD Shermans. I have a possible reason or an idea at least as to why, the train of thought started with the comment by 'bodston' that the US DDs were mainly late large hatch M4A1s. I have done a lot of research on Shermans recently for a 1/16 rc model build based on one from Band of Brothers and in part of that I studied a DD recovered a few miles away from me back in the 80s (one of my research pictures is attached). 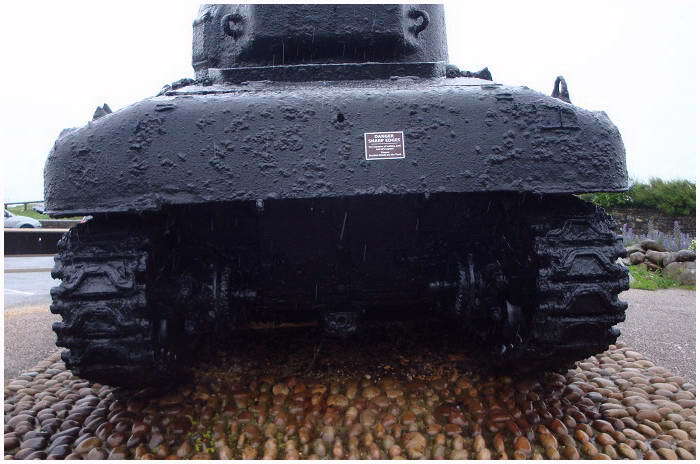 This DD was lost in exercise Tiger which was a practise for the Normandy landings and would have been used on the day on Omaha if it had not been lost at sea, it is a late hull M4A1. These late hulls have a longer cover over the rear area of the tank where the exhaust pipes are (see 1st attached picture), this happens to line up with the bottom of the skirt fitting (second picture on your page)). 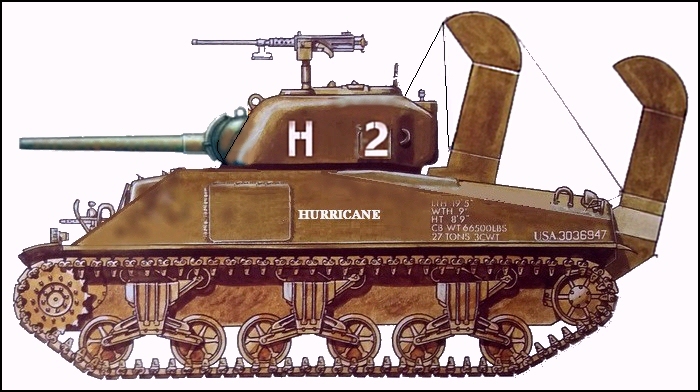 Therefore there would be no route for the exhaust gases to escape other than the pipes sticking in the water so perhaps they fabricated a funnel similar to the deep wading trunks to run under the lower lip in the armoured rear of the tank and up through the bottom of the skirt and then up near the top of it. You wouldn't see this funnel on the other model DDs because they didn't need it, and remember a lot of the American DDs were lost in the channel due to the error in departing them from the ships etc so fewer examples survived if any. I apologise for my rambling, I had an idea and needed to write it, I hope this in some ways answers your question, I know it was asked several years ago but perhaps a late answer is better than none. Yes it is an old question, but it stil stands. You could have given me the right answer there. It's a pitty that not a shred of evidence in pictures are to be found or have come to light so far. I can't believe that there has never been a photo taken of the construction or that a drawing excists of it. 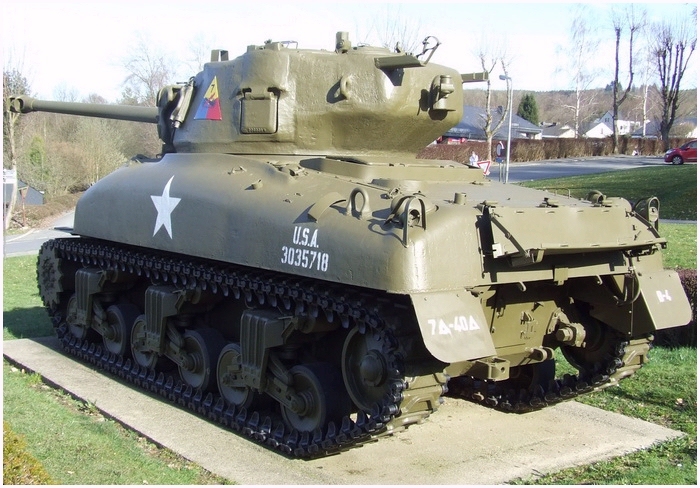 I run an article (sorry in Dutch) on the DD tank: http://www.strijdbewijs.nl/tanks/sherman/m4a1(76)w/actie3.htm (belonging to this: http://www.strijdbewijs.nl/tanks/sherman/m4a1(76)w/home.htm) and not a picture shows pieces of these 'funnel' (and there is a fine one of an M4A1). If you don't mind, I will post your answer under the article with the pictures of Capa. And maybe someday a picture will emerge. 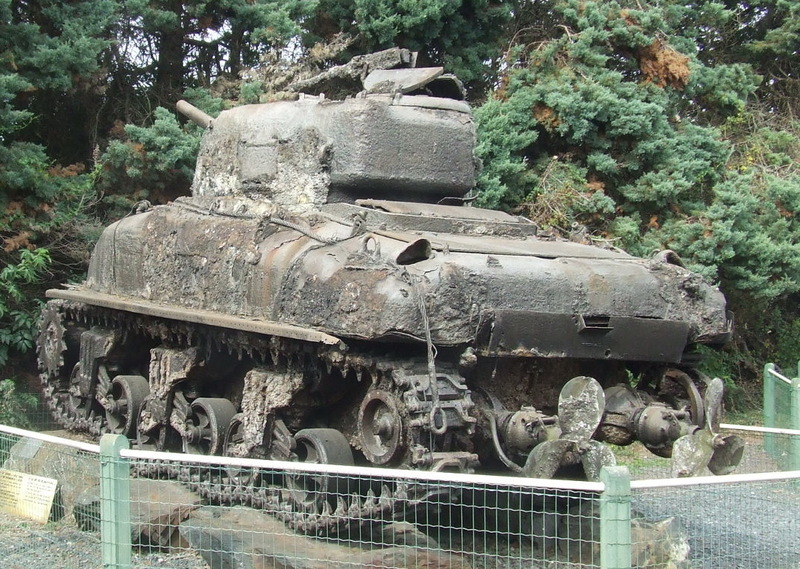 Enclosed is a picture of an M4A1 DD tank at the Musée de Epaves sous-marines de Débarquement, near Bayeux. But also here, no trace of funnel 'debries' (but I spoke too soon,... see below). Thanks Dave for your reaction. 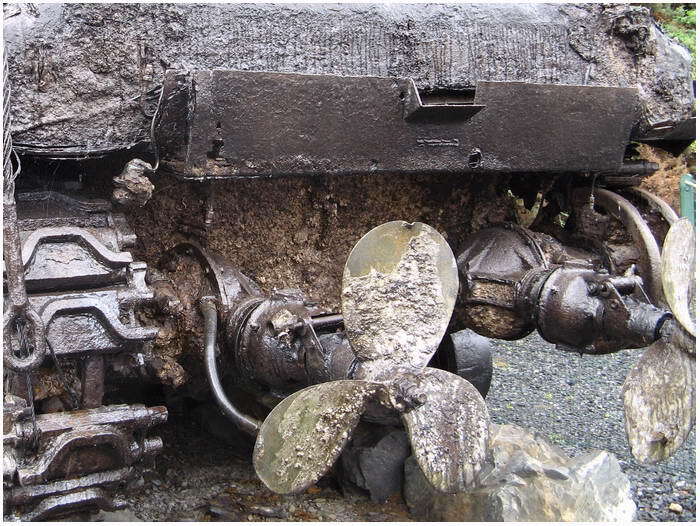 A couple of weeks later, after closer inspection of another picture of the Sherman at Musée de Epaves sous-marines de Débarquement, it has the underside of a funnel on the rear of the Sherman. My first impression was that the 'plank' on the back was the 'cargo-tray'. But this tray was placed higher on the rear of the tank. So, the M4A1 at the Musée de Epaves sous-marines de Débarquement has pieces left of the exhaust on the outside, at the rear, of the Sherman.